As is perhaps to be expected, the range of Dubrovnik accommodation is second to none. There are many, many hotels, ranging from gorgeous 5 star luxury to something a little more modest. Amongst the more famous hotels are The Pucic Palace (which is one of only two hotels in the Old Town), the Hotel Excelsior and the Grand Villa Argentina. As mentioned, there are only a couple of hotels within the Old Town itself (The Pucic Palace and the Boutique Hotel Stari Grad), and a few more about a 10 minute walk away. Unsurprisingly, these tend to be the pricey ones! However, there are plenty of private apartments and rooms in the Old Town. There is more choice of mid-range hotels on the Lapad and Babin Kuk peninsulas in the west of the city, although there’s certainly also some luxury accommodation here too such as the 5-star Hotel Dubrovnik Palace, Hotel Ariston or the Hotel More. Hotels here tend to have more amenities (as they’re larger), including pools and wellness/fitness centres; they are also usually located close to a beach. Other hotel highlights in this part of Dubrovnik include Hotel Kompas, the Valamar Argosy Hotel and the Hotel Neptun Dubrovnik. Another visitor favourite is the 5-star Sun Gardens Dubrovnik. This is actually located in Orasac, about 9km away from Dubrovnik, but the hotel has amazing facilities including a pool, private beach, spa and fitness facilities and eight restaurants on site! There is even a kids club to entertain the little ones. The Buza Hostel (beds in 4- or 6-bed mixed dormitories) and the Hostel Angelina (twin or triple rooms, plus beds in mixed dormitories) are located right in the Old Town. The Love Dubrovnik Hostel (private rooms and beds in dormitories) is also highly rated, and is situated just outside the Old Town. If you fancy camping, there is the Solitudo Sunny Camping by Valamar campsite which is also on the Babin Kuk peninsula. 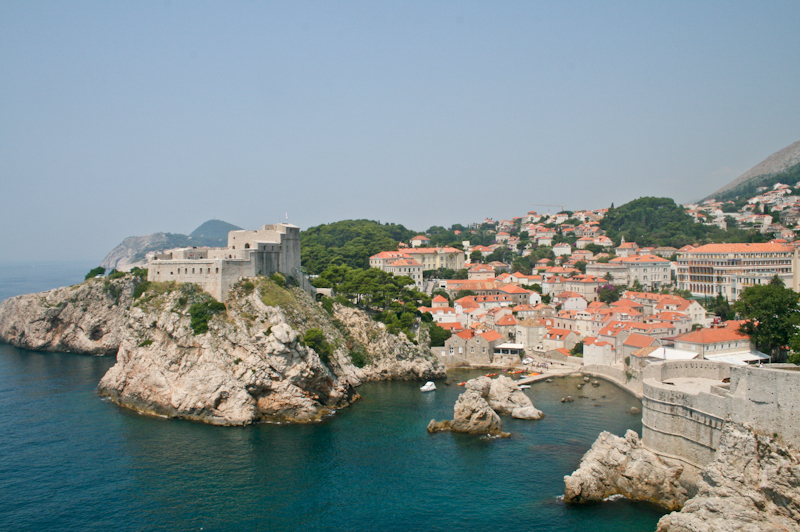 There is plenty of private accommodation in Dubrovnik and the surrounding area. Use the above search box/map to search for apartments and rooms. For a full guide to the various accommodation options in the city – from hotels (including boutique ones), villas, hostels and private apartments and rooms – take a look at our special Accommodation in Dubrovnik page. Be sure to also take a look at our Accommodation in Dubrovnik Old Town page for options within the Old Town walls.